2016 is here, and a year of new resolutions and promises can meet a lot of things. What do you want to do? Travel? Fall in love? Get fit? 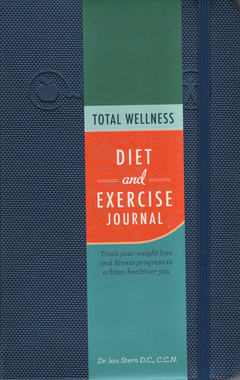 Although The Total Wellness, Diet and Exercise Journal can’t help you do all of these things, it can help with diet and weight loss goals. 1. Eat slowly and chew your food for at least 10 seconds. This ensures that the digestive enzymes have an adequate amount of time to work on the food, helping the digestion process. It also lets the nervous system catch up, making you feel full on smaller amounts of food. 2. Eat smaller portions by eating more frequently throughout the day. Food digested by the body is utilized for energy and any excess calories are stored in your adipose tissue (fat cells)! Even healthy power carbohydrates and proteins will be shunted to the fat cells if too much is consumed at a given time. Furthermore, since the body can only process so many calories at any given meal, big portions can cause digestive bloating, energy reduction, and weight gain. 3. Do not eat three hours before bedtime. By eating late at night, it triggers the body’s hormones to put on body fat. The optimum would be to stop eating three hours before going to sleep. 4. Drink herbal teas to reduce nighttime cravings. Since the same part of the brain that is responsible for hunger is also in control of thirst, we can reduce urges to eat in the evening by filling up on healthy drinks, such as herbal teas like chamomile, lemon balm, lavender, and peppermint. 5. Include a protein source at all meals. Controlling insulin levels has a dramatic effect on the body’s health. Including protein in your meal slows the release of insulin allowing for more stable blood sugar, less cravings, and more energy throughout the day. High blood insulin levels released from a high glycemic meal (lots of carbohydrates/sugars without any offsetting protein and fat) prevents fat from being released from the fat cells for energy and causes cortisol to be released into the blood stream (this is the hormone that causes increased belly fat). 6. Control your stress. Cortisol is a hormone that is released by the adrenal glands when you are under stress. If the cortisol levels rise too high for an extended period of time, it can be dangerous because it increases the potential for Type 2 diabetes, increases the ominous belly fat, and reduces your immune system function leading to potential illness. Higher cortisol levels also trigger a stimulus to make you hungrier; that is why you want ice cream and chocolate when you are stressed! Meditation, exercise, and listening to music are just a few ways to limit stress. There’s no need to reinvent the wheel when it comes to starting a healthy lifestyle. Thousands of people have already transformed the way they look and feel, applying the easy-to-follow system that is outlined for you in this journal, and you too can start enjoying the benefits of Total Wellness. A food journal is an intergral part of losing weight, and this diet diary centers on the positive, getting you to think about healthy power foods, water intake, and increasing your power fiber, while taking notes of how you felt to keep you on a good healthy track. Daily fitness routines are another corner stone to healthy living. The daily exercise portion helps you detail the activity performed and time spent doing it, encouraging you to utilize the exercise specific notes to chart the details of your training. Remember to chart the fundamentals such as your intensity performed, interval training, and progressive resistance. You can even note in the workout summary how you did for the day. Did you achieve your goals? How was your mood and energy? Be sure to note the changes you want to make the next time.